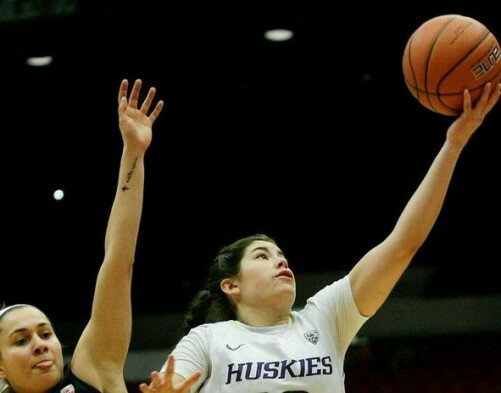 Somehow, the Pac-12 coaches didn’t vote Washington’s Kelsey Plum the Player of the Year. As the conference tourney plays out this week at KeyArena, some teams may pay for the oversight. Kelsey Plum, the fabulously ferocious point guard of the Washington Huskies, is every bit as intense as she is talented. On and off the court. Plum might play with even more fire than usual when the Pac-12 Conference women’s basketball tournament kicks off Thursday at KeyArena for the fourth consecutive season. Plum, on pace to break the single-season conference scoring record, was not pleased to learn she was not named Pac-12 Player of the Year by coaches. Plum ranks third in the nation with 26.5 points per game. The junior from Poway, CA., leads the conference in scoring and minutes played (37.8), and she’s eighth in assists (3.8) and 10th in steals (1.6). “I absolutely think she’s had the best year of maybe any player in the conference’s history,” Washington coach Mike Neighbors said. Neighbors offers nothing but praise for Player of the Year Jamie Weisner of Oregon State. The senior wing from Clarkston averages 17 points, 30.9 minutes, 2.1 assists and 1.1 steals. Weisner did not join Plum among the 20 finalists for the Wooden Award as college basketball’s top female player. Weisner topped Plum’s 26.5 scoring average only once this season, and that was with a 27-point effort. Plum moved to point guard this season after playing on the wing her first two seasons at Washington. For three consecutive years, she’s made the all-conference team, served as a team captain and broke the Huskies’ single-season scoring record. She often guards the opposition’s best player. “Kelsey Plum is definitely one of the best guards in the nation,” Colorado coach Linda Lappe said. Neighbors says “no one is going to be in the gym more often” than Plum, who admits to wearing down at times this season. “I’ve pretty much played 40 minutes all the time,” Plum said. “I kind of had to learn how to play tired. It can be difficult trying to hit shots when you’re tired and guard people when you’re tired. “It’s more a mental test than anything. I know, too, as someone that’s depended heavily on, if I don’t really come to play, we’re not going to be in the game. Plum takes more than a third of the Huskies’ shots, and she leads the nation with 215 free throws made. She already holds the Pac-12 record for career free throws made, thanks to her willingness to drive to the basket despite being a smallish guard. Plum has admitted to being 5-foot-7, even though the Huskies listed her at 5-9 for two years before going with 5-8 this season. “She’s shrinking!” teammate Katie Collier shouted with delight. Neighbors seemed genuinely stunned when a stranger asked if Plum ever lets up on the basketball court. Multiple Pac-12 teams will advance to the NCAA tournament, but only the conference tournament champion receives an automatic bid. Neighbors said he’s confident the fifth-seeded Huskies have already clinched a spot in the Big Dance for the second consecutive year . . . Oregon State and Arizona State, teams known for outstanding defensive play, shared the regular-season title with 16-2 conference records. The Beavers earned the No. 1 seed by virtue of their win over ASU in the only meeting between the teams . . . Defending champion Stanford, another strong defensive team, has won 11 of 14 tournament titles. The Cardinal’s No. 4 seed is the lowest in school history . . . The top four seeds don’t play in Thursday’s opening round. Everyone else must win four games in as many days to earn the title . . . Four teams are ranked in The Associated Press Top 25: No. 8 Oregon State, No. 10 Arizona State, No. 11 Stanford and No. 12 UCLA. 2 p.m. – No. 3 UCLA (22-7) vs. Oregon-Arizona winner. 6 p.m. – Saturday’s winners. All games televised on the Pac-12 Networks except for the championship game on ESPN.